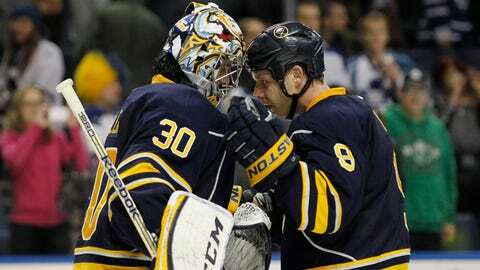 Steve Ott (9) congratulates goalie Ryan Miller after the Sabres beat the Maple Leafs last November. BUFFALO, N.Y. (AP) Once the shock and emotions of leaving Buffalo and the Sabres began to wear off, goalie Ryan Miller began looking forward to the challenge he and Steve Ott will face in living up to the St. Louis Blues’ expectations. Sabres no more, Miller and Ott are going from the NHL’s worst team to a bona fide Stanley Cup contender after being traded to the Central Division-leading Blues in a five-player, two-draft-pick deal Friday night. "It’s definitely humbling and flattering that they would make that kind of move and bring us in with the intention of giving them some help to push for a Stanley Cup," Miller said. "We’re excited for the opportunity there. But also, it’s about the responsibility we have to that organization to show up and get up to speed and compete as hard as we can to live up to the trade." With his voice at times cracking with emotion, Miller spoke at a news conference during the first intermission of the Sabres’ 4-2 victory over San Jose. The deal was made about an hour before the game, and marks the first significant move since Tim Murray took over as Sabres general manager in January. In exchange for Miller and Ott, their captain, the Sabres acquired goalie Jaroslav Halak, forward Chris Stewart, prospect William Carrier, a 2015 first-round pick and a conditional 2016 third-round pick in a deal reached in advance of the NHL trade deadline Wednesday. Murray explained that the pick in 2016 could turn into a first-round pick in this year’s draft if the Blues reach the Western Conference finals or Miller re-signs with St. Louis before the draft. The Sabres will also retain a portion of what’s left of Miller’s $6.25 million contract this season. The Blues shored up their goaltending in an attempt to avoid another disappointing playoff run after being eliminated by Los Angeles in successive seasons. Miller was expendable in Buffalo because the 33-year-old was in the final year of his contract and the Sabres were concerned he’d have little interest re-signing with a team early into its rebuilding stage. Blues general manager Doug Armstrong made the deal with a more short-term objective in mind. "The deal was made on the here and now. We’ll worry about the future after the season," Armstrong said during a telephone conference call. "Obviously, Ryan Miller’s resume speaks for itself. It gives us a better chance for success." Miller won the Vezina Trophy as the NHL’s best goalie in 2010, the year he was the Most Valuable Player of the Olympic tournament in Vancouver, and is Buffalo’s franchise leader with 284 victories and 540 games. This season, he’s 15-22-3 with a 2.72 goals-against average and .923 save percentage. Watch the ‘Blues Live’ pregame and postgame shows before and after every St. Louis Blues game on FOX Sports Midwest. Ott has credentials as a leader and provides the Blues a gritty two-way forward. "He’s an antagonistic player," Armstrong said about Ott, also in the final year of his contract. "He’s a player that has that playoff pedigree." Sabres coach Ted Nolan was set to start Miller against San Jose, but the goalie and Ott did not take the ice for warm-ups and were scratched. Murray said Armstrong first inquired about the possibility of landing Miller before the Sochi Games, and the two continued talking during the Olympics. Murray was pleased in getting his first trade out of the way, and hasn’t ruled out making further deals. Forward Matt Moulson and veteran defenseman Henrik Tallinder also are in the final years of their contracts. "There are a lot of guys that teams have shown interest in," Murray said. "So I’m just listening." FOX SPORTS MIDWEST GIRLS: Read their bios, check out their upcoming appearances and view their photo galleries and videos. Halak, also in the final year of his contract, was in his fourth season with the Blues after spending his first four years with Montreal. He has a 24-9-4 record with a 2.23 goals against average, a .917 save percentage and four shutouts this season. Stewart has 15 goals and 11 assists in 58 games for the Blues this season, and 115 goals in six seasons with Colorado and St. Louis. The 19-year-old Carrier was the Blues’ second-round pick in 2013. Though aware he was on the trade block, Miller had difficulty coming to grips with leaving a team and a city that he regarded as home for 12 years. "I don’t know if I’ll make it through this, so let’s keep it quick," Miller said, his voice already quaking. "I’m really going to miss this part of the world." Ott had preferred to stay in Buffalo, but understood that he was likely to be traded by a team seeking to rebuild. He was particularly excited to be joining the Blues with Miller. "It’s amazing. 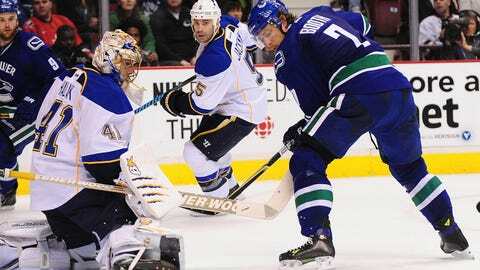 This guy right here is the best goalie in the world," Ott said. "He has been our best player, our MVP in Buffalo in a tough, tough season. To have that opportunity to go along with Ryan for myself, I know how great he is. Both of us want to live up to expectations."